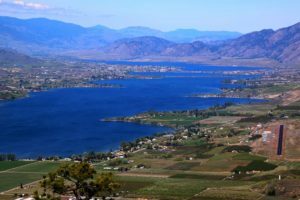 Clean Drain & Dry your watercraft before you launch it in Osoyoos Lake. Make your commitment today to stop the spread of Zebra and Quagga mussels! The Invasive Species Council of British Columbia is requesting that all watercraft and outdoor recreation enthusiasts commit to following Clean Drain Dry principles as soon their boat or watercraft is removed from a body of water. ISCBC is working to minimize the negative ecological, social, and economic impacts caused by the introduction, establishment, and spread of invasive species. Their goals are to: educate the public and professionals about invasive species and their risks to ecosystems and economies through activities such as workshops, seminars and newsletters; coordinate research relating to invasive species and make this available to the public; and undertake and support actions that improve the health of BC’s natural ecosystems. Zebra and Quagga mussels are not native to North America. They were introduced from Europe into Canada (the Great Lakes region) and the United States in the 1980s. Since their introduction, these mussels have spread throughout Ontario and Quebec and they are now found in at least 24 American states as far west as California. In October 2013, zebra mussels were discovered in Lake Winnipeg, Manitoba. To date, there has been no reported introduction of live zebra or quagga mussels into BC lakes or waterways. These small, freshwater mussels can easily attach themselves to boat hulls, trailers, motors, equipment, vegetation and other organisms. They multiply rapidly and are extremely difficult to eradicate once they become established in an area. In larger water bodies and complex ecosystems they may be impossible to eradicate unless detected and contained before they become established. Zebra and Quagga mussels can survive for several weeks without being immersed in water if they are left in a cool and moist environment. That means mussels attached to boats or equipment can be transferred from one body of water to another. Mussel larvae are extremely small and can float undetected in live wells, pumps, bilges, bait buckets and other fishing gear, where they can survive for several weeks. Zebra and Quagga mussels pose a serious threat to BC’s aquatic ecosystems, salmon populations, hydro power stations and other infrastructure facilities. They can clog pipes (increasing maintenance costs for hydroelectric, industrial, agricultural and recreational facilities), cause ecological and economic damage, displace native aquatic plants and wildlife, degrade the environment and affect the quality of drinking water. The economic impact of these invasive mussels to hydropower, agricultural irrigation, municipal water supplies and recreational boating has been estimated to be $43 million per year. This estimate does not include additional impacts on commercial and recreational fisheries. What YOU can do to prevent aquatic hitchhikers like Zebra and Quagga mussels from entering our pristine BC waters. CLEAN off all plant parts, animals, and mud from boat and equipment (e.g. boots, waders, fishing gear). Use a power wash station if available. DRAIN onto land all items that can hold water (e.g. buckets, wells, bilge and ballast). DRY all items completely before launching into another body of water. The Clean Drain Dry initiative encourages all watercraft users to ‘clean drain dry’ their boats and equipment to help reduce the spread of invasive plants and organisms to BC waters. Boats and other watercraft are also a frequent method of invasive species entering key habitat within BC such as the province’s lakes, streams and wetlands. With jurisdictions across North America struggling with the impacts of this aquatic invasion, the need for boaters and other outdoor recreation enthusiasts to pay attention and take action is growing rapidly. Osoyoos Lake looking north from Oroville, Washington State. Click on the video or link below to find out how you can take action to help protect BC’s waterways from invasive species like zebra and quagga mussels. Click on the logo or link below to view a Clean Drain Dry webinar that discusses invasive species including Zebra and Quagga mussels and Eurasian Milfoil. The webinar is aimed at training Invasive Species Ambassadors, however, the information in this webinar is valuable to all Osoyoos Cottages home owners and their families. All BC residents can become Clean Drain Dry ambassadors. Commit to doing YOUR part in stopping the spread of aquatic invasive species in BC and beyond. Commit to cleaning, draining and drying your watercraft before entering another water body. CLICK ON THE LINK BELOW TO SIGN UP ONLINE TODAY! Other useful invasive species resources for Osoyoos Cottages homeowners and Boat Slip Licensees.